Mr. Boomer and I spent most of the past weekend dealing with the ever-increasing bill for television and internet service. Reading how other personal finance blogs eliminated or reduced their cable bills inspired us to take action. Well, that and a $8 increase in the monthly bill! It wasn’t all that long ago that we last changed television service providers. In those 14 months, the bill has increased $17. Generally, those increases creep up on you, one or two dollars at a time. But this last one got the attention of both of us. We have three options other than our current provider. We could go back to the cable company or try either DISH or DirectTV. The cable company would save us some money, but not enough. We decided to try out satellite. It’s a two-year commitment so the decision wasn’t easily made. My extended family has had positive experiences with DISH and they had the best prices so we went with them. The order was placed on Saturday and installed on Sunday. It took three hours to install the dish and get three televisions going. Add this to the time we spent researching and discussing options and you can see it took a large part of our weekend. The DISH bill is being reduced by $20 per month for the first year, but even when it bounces back to the full price it is a savings over the last provider. We still need to figure out what we’re going to do for internet service as it’s bundled right now with the last provider. The picture seems better to us than either of the last two providers. But the DVR functionality is not as advanced. We can’t watch one program and DVR another on the same TV or watch recorded programs from any receiver. This loss in functionality is worth saving $50 a month. Have you researched options for your television service lately? The savings you’re gaining per month is awesome! I’m hoping that as soon as we bundle our phones (which should be this month) I will see a savings of $40 with the added benefit of cable. Of course since we actually don’t own a television (I know, we’re strange) we’re running it through our computer monitor and having some issues with sound. I’m sure my husband will get it figured out, but it seems silly to spend money for something we can’t use right now with the idea that there will be some savings. Little House, I think you were one of ones that inspired me. I wish we could cut the cable, but my husband really enjoys TV and I must confess I watch more than I should. Buck, we ended up keep U-Verse for internet but downgraded it to a slower mode (and frankly we can’t tell the difference) for another $5 a month savings. I can’t imagine not having cable in SoCal! I didn’t have a cable TV subscription for about two years. I was busy at that time and didn’t have any time for TV. I saved a lot and became more productive. Jane, I agree; but it won’t fly in my household. It’s one of those compromises of marriage. i think you can do much better by trying Roku. We would probably be willing to try Roku except we both enjoy watching live sporting events. most of our entertainment is done online, we can catch almost anything that is really interesting on youtube and alike. Our solution at home was to get rid of the TV and buy another pc packed with educational games with the savings, asides the good online game sites. @Alston, until we can count on seeing sporting events and favorite shows online, we won’t be able to swtich. @ Gerald, we don’t watch TV to be educated. 🙂 If I had young kids, your idea might have been an option. Evan, we live in a condo and got the dish. But they’ll only do it for owners. Hey this is Nate with DISH Network. I ran across your post and wanted to know what type of DVR you had and if it was HD! 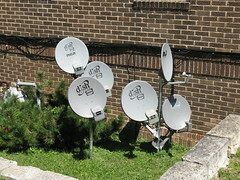 DISH Networks 625, 622, 722, and 722k should be able to record one show and watch something different on these model DVR receivers. If you have one of these model receivers you can chat with us on our online website or buy calling out tech support that is 24/7 so when can help you with that issue. Also ask about out free HD for life this is normally a $10 monthly charge so this is $120 savings a year. Unlike cable you can get TV everywhere from your mobile device with DISH Network we have the most HD channels in the industry!